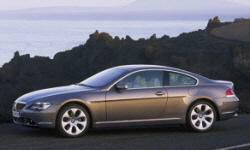 Why the 2005 BMW 6-Series? This is a big car, but for the most part, it carries its' weight well. With the Sport package, it turns in precisely, corners flat, and isn't upset by mid-corner bumps. The 4.4 liter V8 is as smooth, torquey, and responsive as you would expect from that layout. The six speed automatic is adequate in auto mode, more crisp in sport. In either mode, it holds a gear when cornering. The bulk of the car is put to good use in the sense that the car is amazingly quiet. Whispered conversation is audible even at highway speed. Contrary to the reputation of high end German cars, it has been very reliable over the four years and 30,000 miles I've owned it. Apart from normal wear and tear items (tires, fluids, wiper blades), only a leaking windshield washer pump and the trim around the door seals have needed repair/replacement. The brakes are smooth, linear (no "dead" travel in the pedal), and quiet. On the street, they provide everything you are likely to need. Why Not the 2005 BMW 6-Series? For whatever reason (perhaps that it's seen as a luxury toy), depreciation is brutal. When I bought it at 4 years old with 12k miles, its' value had already dropped 50 percent. With a further 4 years and a total of 43k miles, it has dropped another one third plus. It's a very well rounded car - it does nearly everything well, and nothing badly. As a used car, at least, it justifies its' price.